Leading Manufacturer of ldpe rolls and ldpe plastic rolls from Bengaluru. Low-density polyethylene (LDPE) Rolls are also one of the most widely used and demanded products of our company which we are not only manufacturing but also are efficiently supplying in different regions of the country. These LDPE rolls are widely being used in several commercial purposes such as malls, supermarkets, food bazaars, retail shops and several other such places for providing an easy and comfortable way of carrying and packaging the materials. These LDPE rolls are available for our clients at a very reasonable range of prices in the market. With enriched industrial experience and knowledge, we are providing an excellent range of LDPE Plastic Rolls. 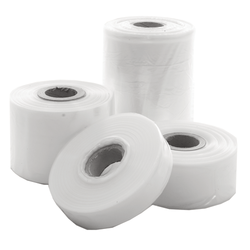 Looking for LDPE Rolls ?